The task of doing laundry is very tiresome and time consuming for many people but the fact that it is a necessity cannot be neglected. Traditional way of laundry consisted of taking soiled clothes to the waterways, where clothes were rubbed, twisted, slapped against rocks to remove hidden filth within. Eventually, this was replaced by the advent of in-house plumbing, where people were able to do laundry inside their homes. Thereafter, the invention of the first electric washing machine, named Thor machine in 1908 introduced by Hurley Machine Company of Chicago proved to be a major event in the history of laundry services. The invention greatly helped in reducing the manual work involved in doing laundry. After the industrial revolution, the practical function of washing clothes became a way to achieve the economic objective of reducing costs and making money. The heavy laundry work and the falling laundering prices enticed the households to send the clothes to the laundries. Cities such as New York, Chicago and Los Angeles amongst others are reported to have multiple successful laundry franchises which includes WashClub and Washio. One of the challenges that Cleveland faces is the ratio of smaller number of urban population to the increased native population. However, the resurgence in downtown Cleveland and the rising population of outsiders coming in, there is an influx of potential customers that a Cleveland business could capitalize on. Tourism in the same region is growing and is expected to present business opportunity for the global online on-demand laundry service market. The online on-demand laundry service facilitates door pickup and delivery of clothes by hired delivery professionals that have partnered with local laundry firms. Many startups and entrepreneur have invested in this service line as they have seen tremendous growth in it. People just have to open an app, tap a button and order this online service. Companies such as Washio, Rinse and Cleanly have already realized the potential of this technology enabled service. Recently, a China based laundry service company Edaixi, changed its traditional way of laundry services to on-demand and reported an annual revenue of US$ 123.2 Mn. The partnership with local laundry services and the integration of informational technology has helped the company to bring a massive increase in its revenue generation. The global online on-demand laundry service market was valued to be US$ 12393.42 Mn in 2017 and is anticipated to be US$ 52688.90 Mn by 2022. Duvet Clean is one of the leading segments in types of laundry services. Duvets and quilts are the most neglected items of bedding. Duvets filled up with feathers, wool, silk or any other synthetic material cannot be cleaned manually as they require extensive manual work for washing and secondly, their size makes them difficult to wash and iron. Also, there is a risk that manual cleaning might spoil the expensive duvets. Urban population mostly opts for professional laundry cleaners rather than cleaning them at home as they cannot be put even in washing machine owing to large size. The duvets that are filled with feathers are somewhat difficult to clean, whereas duvets filled up with synthetic fibers undergo deformation in size, if cleaned manually. They require experts, who can check the fillings and decide what type of treatment to be given depending upon its color, size, strain concentration and others. As per the American Hospital Association, the number of community hospitals in the U.S. is 5,534 and the number of staffed beds in these hospitals is 780, 272 each. Any outpatient admitted to these hospitals generates on an average 10 clothes for laundry per day. These clothes contain blood and chemical strains along with the bacteria of the disease from which the patient is suffering. If such clothes are washed at home, then there is a risk of the washer getting affected through same type of infection increases. So, most of the hospitals opt for laundry services. 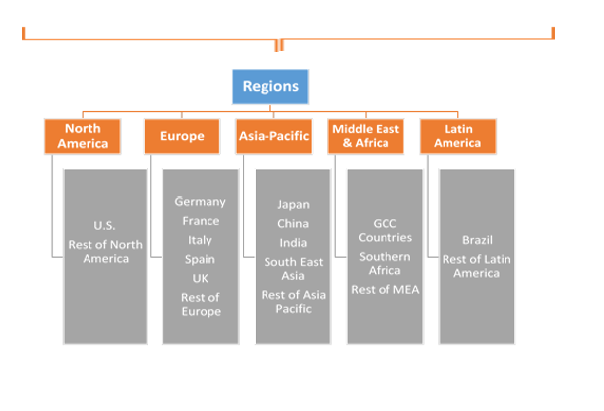 This makes North America dominant amongst others in the online on-demand laundry service market. 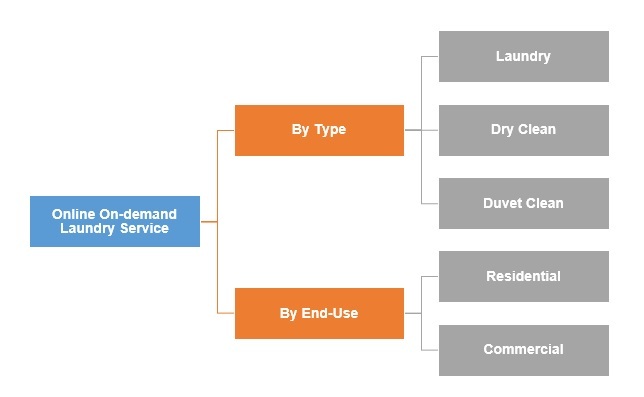 Online on-demand laundry service market participants include CLEANLY, delivery.com, DRYV, Edaixi, FlyCleaners, ihateironing, Laundrapp, Laundryheap, Laundrywala, Mulberrys Garment Care, odtap.com, PML Solutions, Rinse, Tide Spin, WASHMEN, Wassup-On-Demand and Zipjet Ltd. amongst others. In May 2017, Cleanly a New York based laundry services company acquired dry cleaning and delivery services offering company, The Dhobi to extend its online on-demand laundry services further.